Visitors who want to be close to everything the Crystal Coast has to offer – including charming downtowns, shopping complexes, hopping beaches, and everything in between – may want to set their vacation sights on the central town of Morehead City. This small town features easy access to area beaches, a great shopping and dining scene, and a cool waterfront downtown with miles of views. As a result of these combined factors, Morehead City is a fine destination for any Crystal Coast visitor who wants to experience it all. And while Morehead City has its fair share of local motels and hotels, visitors who would like to enjoy an extended stay will want to consider reserving a vacation rental. 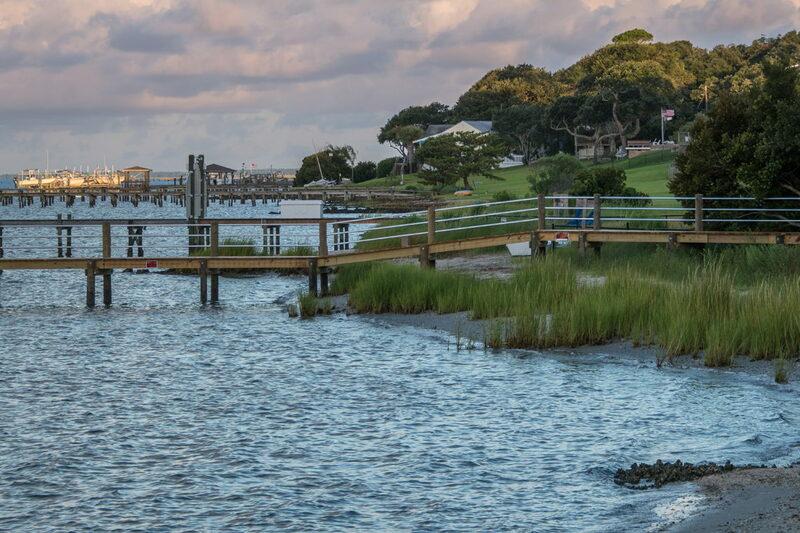 With a nice variety of diverse options that can range from chic waterfront condos to stunning and historic cottages, the vacation rental scene in Morehead City may be small, but it’s nevertheless nicely varied and charming from the inside out. There are a number of benefits to staying in a vacation rental as opposed to a local motel or hotel, and visitors who are perusing their accommodation options for an upcoming Morehead City stay will want to consider the following attributes. The Price: Traditionally – and especially for multiple day stays – a vacation rental is often less per person than the cost of a motel or hotel suite. This is especially true for Morehead City vacation homes that are slightly inland, or that have multiple bedrooms, as families can share an entire home instead of each person or couple having to purchase an individual hotel / motel room. The Space: Vacation rentals have much more space than a motel or hotel room, which typically only has a bed, a mini-fridge or kitchenette, a bathroom, a balcony, and not much else. Comparatively, a vacation rental – even a one bedroom condo unit – features a kitchen, living area and / or dining area, separate bedrooms and bathrooms, private porches or balconies, and much more room to stretch out and relax. The Amenities: Depending on the individual vacation rental, guests will be treated to a suite of amenities that aren’t found at standard hotels or motels. These amenities can include, (but are not limited to), full kitchens, free wireless high speed internet, multiple TVs, book and / or movie libraries, community or private pools and fitness centers, waterfront views, porches and private yards, hot tubs, and much, much more. The Money Saving Extras: Because vacation rentals have on-site extras like full kitchens with cookware, dining areas, and at-home entertainment, guests can save a lot of money on dining out for three meals a day, going out for entertainment, or other daily essentials. As a result, these funds can be better spent at the weekly Morehead City farmers’ market for fresh produce and goodies to enjoy at home, or at the chic local stores and boutiques for cool and coastal souvenirs. Morehead City may not have the largest collection of vacation rentals along the Crystal Coast, (there’s roughly a few dozen at most to choose from), but it does have one of the most varied and distinctive collections. Morehead City vacation rentals can include posh condos in the heart of the downtown area, cool townhome units on nearby waterfront Radio Island, unique coastal cottages that are tucked along the Downtown Streets, and sprawling homes that have big yards and which are found on the outskirts of the region. Visitors who want to enjoy daily strolls to local cafes, pubs, shops, and the waterfront, will want to concentrate their search on the downtown area. Here, a number of condos and small cottages can be found with ease – many of which with brilliant waterfront views and / or easy waterfront access. Visitors who want to be close to the water will want to search east to Radio Island, or north to the small collection of homes and units that are close to the Newport River. These vacation rentals may be a few miles away from the heart of the downtown area, but they offer panoramic water views that serve as an enchanting backdrop for any vacation. Finally, vacationers who crave lots of privacy will want to look north to inland Morehead City and the neighboring town of Beaufort. Here, the homes have wide shaded yards and resemble residential properties, with lots of peace and quiet. There are two ways to find and rent vacation rentals in Morehead City and the surrounding areas. While all vacation rentals are individually owned, many vacation rentals are represented by local vacation rental companies, or property management companies, which take care of the booking, housekeeping, and regular upkeep of the individual properties. As a result, guests work directly with the property management company – and not the owner - to rent the home, make payments, and take care of any issues or questions during their stay. The benefit of using a vacation rental company is that the company is staffed with a team of guest service specialists, maintenance personnel, housekeeping teams, and other employees who can address any questions or problems the moment they arise. Other vacation rentals are rented directly by the owner to the potential guest on websites like VRBO, HomeAway or Airbnb. On these transactions, the guest and owner communicate directly with each other to determine how to acquire keys, make payments, and other aspects of an upcoming stay. The benefit of renting directly through an owner is that dates of stay may be flexible, (often vacation rental companies rent properties on a weekly Saturday-to-Saturday or Sunday-to-Sunday basis.) In addition, guests have a single point person to talk to when any questions or problems arise. Either method can serve as a fine option to find or rent vacation rentals, but the process to do so is more or less the same. Essentially, prospective guests can conduct an online search to find vacation rentals that suit their specifications in terms of number of bedrooms, location, amenities and more. Both property management companies and for-rent-by-owner sites have detailed descriptions on available vacation rentals, which include photos, amenities, maps, virtual tours, and / or all of the above. Once the property has been paid for and the lease has been signed, guests will then get check-in instructions and will either arrive at the property itself on the day of check-in, or at a central vacation rental office to pick up their keys and check-in packet. Check-in and check-out times are generally similar to hotels, (afternoon check-ins on day of arrival and mid-morning check-outs on day of departure), and guests are generally notified of any specific instructions or considerations for an individual property (such as pet policies or pool availability) before their stay. Private dock – Several homes that are close to the water may have a private dock or pier where guests can enjoy a waterfront sunset, launch a kayak or stand-up paddle board, drop a fishing line, or just relax with an incredible view. Private boat slip – Some vacation rentals – and especially condos or townhomes in waterfront complexes – may have a private boat slip that comes complimentary with every stay. This makes it easy for travelers along the Intracoastal Waterway (or ICW) to drop anchor and enjoy a few nights on land without worrying about the safety or security of their vessel. Community pools, game rooms, fitness centers, and more – The Morehead City area’s condo and townhome complexes often feature a wealth of on-site amenities which can include seasonally available outdoor pools, on-site fitness centers, game or club rooms, community beaches or docks, and even concierge services. Check your accommodations’ website beforehand to see what community oriented amenities may be available. High speed internet access – The majority of vacation rentals offer high speed internet access for guests, free of charge. Guests will often have to bring their own laptops, although several vacation rentals may have on-site computers or tablets for guests’ use. Pet Friendly – Pet friendly accommodations are becoming more and more in demand, and a number of vacation rentals in Morehead City are pet friendly, or dog friendly, ensuring that visitors can bring their favorite furry family members along. An extra fee may be required to bring along a pet, and guests will also want to look for additional pet-specific amenities, such as fenced-in yards or dog runs, kennels, or other extras that make life easier. Handicapped Accessible - Several homes, and primarily condos or townhomes may be handicapped accessible, which means that they are located on one level and / or have an elevator, and have other features designed for guests with mobility issues, such as handicapped-friendly bathrooms. Check with local vacation rental companies to see which properties are well-suited for vacationers who have mobility considerations. Decks, kitchens, living areas, dining rooms – The greatest attribute of a vacation rental over a hotel or motel room is the ample additional space, and guests who stay in a vacation home, condo or townhouse will be treated to separate kitchens, dining rooms, living rooms, private decks and porches, and / or all of the above. As a result, it’s easier to spread out and find private space, as well as congregate with the family while enjoying plenty of room to move. Towels, linens, blankets, cookware, and other guest equipment – While every vacation rental is different, guests can expect to find a number of basics to make Morehead City living easier. These items include dishes and cookware, blankets, pillows and comforters, toilet papers, trash bags, linens and / or towels, and spice or kitchen basics like salt and pepper. Some vacation rentals may even go above and beyond the basics, and offer enticing extras such as books and magazines, laundry detergent and dish soap, fishing and / or watersports equipment, and more. Determining what you need to pack, and what can safely be left behind, is all dependent on the individual vacation rental. As a result, visitors will want to check with their vacation rental provider or owner to confirm what items they need to bring, and what will be waiting for them when they arrive. With that being said, there are a few key items to look for when scanning a property’s description and / or planning your vacation packing list. Sheets, pillowcases, and towels – Roughly half or more vacation rentals on the Crystal Coast provide sheets, pillowcases, linens and towels, however visitors will want to check before their stay to ensure these items are included. Veritably all vacation rentals do have pillows, mattress pads, comforters, and extra pillows / blankets available, which means that all guests will need to pack are the sheets and towels. Just be sure and confirm before you arrive, so there are no unexpected surprises. Groceries and pantry items – Groceries – and particularly pantry items – may vary from vacation rental to vacation rental, so guests may want to check before they arrive to see what’s already in stock. Guests will generally have to buy their own refrigerated items and groceries, but some vacation rentals may already have the pantry basics, like salt and pepper, coffee filters, paper products, spices, sugar, and other necessities. Ask ahead of time, or wait until after checking in to make a grocery store run. Virtually all vacation rentals do include cookware, dishes, glasses and cups, and utensils for guests. Baby equipment – Many vacation rentals will list in their individual property description what baby-friendly amenities are at the home, such as high chairs, cribs, baby gates, and other equipment. Check ahead to see what baby gear is at the home, and what needs to be brought along. Pet supplies – Pet friendly homes may have pet-friendly extras, such as dog runs or fenced in yards, on-site kennels, pet dishes, and pet / baby gates. Again, it’s best to check ahead to see what can safely be left behind, and what needs to be brought to ensure you and your pet’s comfort during your stay. Household cleaning products – Some vacation rental companies may offer “starter packs” for guests that include dish soap and regular soap, paper products, and other cleaning supplies, and some vacation rentals may already be stocked with detergent and cleaning products when a guest arrives. Forego shopping for these items before your arrival to ensure you’re not doubling up on the products that are already available. Toiletries – While a number of vacation rentals may offer hand soap or basic soap for guests, for the most part, renters will want to bring along their own toiletries, including shampoo and conditioner, toothpaste, razors, deodorant, and other essentials. These can also easily be picked up on a shopping trip at a neighborhood Morehead City grocery store. Laptops and electronics – Most all vacation rentals offer high speed internet access for guests, but many do not have on-site computers, laptops, or other computer equipment for security reasons. Check beforehand, and be prepared to bring your own laptop and gear along on a “working” vacation. Entertainment items – Many vacation rentals have on-site board games, books and / or magazines, and DVDs or movies available for guests’ entertainment. Though every home varies, there are also a number of large chain stores and book stores in the region which makes it easy to pick up a few entertainment items or good reads during your stay. Beach or watersports equipment – Several vacation homes may have bikes, kayaks, fishing poles, beach chairs and gear, and other supplies that make enjoying life by the water even more fun. Visitors will also find several watersports rental options in neighboring Atlantic Beach as well as Beaufort to pick up all the supplies they need to have a blast for the duration of their stay. As interest in Morehead City as a vacation destination continually rises, more and more investors and second homeowners are considering purchasing a vacation rental home in the region. The great thing about owning a vacation rental home is that you can earn extra income by renting it throughout the year on a daily or weekly basis, while enjoying ample time to enjoy it yourself when it’s not rented, or when you’re ready to retire and / or permanently move to the Morehead City area. Prices for vacation rentals can vary greatly, but the Morehead City area is generally less expensive than the competing Atlantic Beach and Beaufort real estate markets. While rental income rarely covers the entire cost of a mortgage or regular upkeep, (depending on the amount of a down payment and the mortgage), it can certainly put a dent in the cost of owning a Morehead City home, and can help owners who eventually want to live and enjoy the Morehead City region for decades to come fulfill their dream. For more information about owning a vacation rental – including rental income projects and considerations – contact a local property management company and / or real estate company in the Morehead City area. Rates for Morehead City vacation rentals tend to vary slightly by the season, which means that the prime summertime rates are generally higher based on demand, while the “off-season” rates can be noticeably lower. Because Morehead City is a Crystal Coast town that is surprisingly busy year-round, visitors can often save money on a vacation by reserving a fall, spring, or even a winter stay. For a larger selection of vacation rentals, include neighboring communities and towns such as Atlantic Beach and Beaufort. These towns, (and Atlantic Beach especially), are filled with vacation rentals offering more options for vacationing parties with specific tastes. Watch for annual events where Morehead City is at its busiest, including and especially the annual Big Rock Blue Marlin tournament which is held in early to mid-June, or the annual Seafood Festival, which is held in late September / early October. The vacation rentals can fill up fast during these popular dates, so book well in advance. While Morehead City is generally protected from hurricanes or tropical storms due to its slightly inland location, visitors who travel during the prime hurricane months (July through early November) may still want to consider purchasing trip insurance. Trip insurance safeguards a vacation from unforeseen weather events, as well as other events such as family emergencies. Morehead City may have one of the smaller vacation rental markets along the Crystal Coast, but the sheer diversity of properties as well as a fantastic central location makes it a tempting destination for renters. With everything from high-rise one bedroom condos to 4-5 bedroom waterfront cottages, virtually every style of vacationer can be accommodated in this up-and-coming coastal town.